The Greatest Queso That Ever Lived Ingredients 1 block (32 Oz. Block) Velveeta Cheese 1 package (8 Oz. Package) Cream Cheese 1 can (10 Oz. Can) Rotel 1 can (10.75 Oz. Can) Cream Of Mushroom Soup 1 pound Ground Beef OR Sausage (or A Combination Of Both) 1 Green Onion *Optional Instructions Brown ground beef or sausage (or both) in a pan over medium heat and set aside. Cut up the Velveeta and cream cheese into cubes and place into a crock pot. 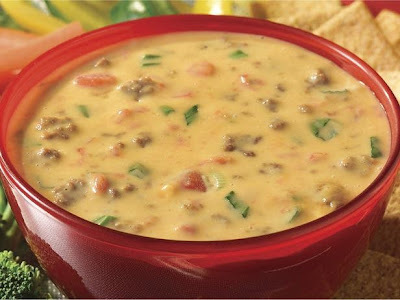 Pour in the Rotel and the cream of mushroom soup and stir ingredients together. Place the crock pot on low setting for an hour, letting the ingredients meld. After about 30 minutes, add the browned meat and continue to let cook, stirring as needed.